Neutrophil extracellular traps (NET), extruded decondensated chromatin entangled with neutrophil proteases, have been first identified in neutrophils stimulated with bacteria or phorbol myristate acetate (PMA) via activation of NADPH oxidase and the generation of reactive oxygen species. 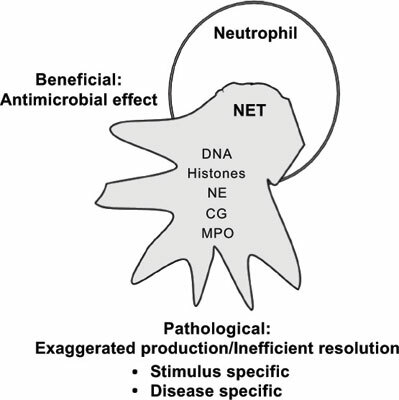 Although the first findings demonstrated the beneficial role of NET formation by trapping the bacteria and limiting their dissemination, numerous studies in the recent decade revealed the multifunctional aspects of NET formation which manifests itself not only in the context of anti-microbial effect but also as a pathological trigger. Uncontrolled and exaggerated NET formation or inability to digest and remove NET have been reported in thrombosis, auto-immune diseases, cancer or even in infertility. Studies are ongoing to disclose the role of NET in different pathological situations and most importantly, NET regulation via compounds that either interfere with NET formation or target NET components such as DNA or neutrophil proteases. Although the final product of NET formation seems to be quite common i.e. DNA entangled with proteases, stimuli that induce NET have a wide range of varieties and the involved pathways are diverse too. Therefore, in every pathological condition, it is necessary to consider carefully the type of stimulus and the signaling pathways in order to target the disease more specifically. Here we briefly summarize some (out of many) NET triggers/pathways and discuss the potential interventions in the pathological situations. Neutrophil extracellular traps, DNA, Histone, ROS, Granular proteins, Nuclease.